"Are you going to Raw Stock?" is not the first thing you would expect a hotelier to enquire as you dropped your bags in the lobby. But Bernard Gray Hall is a B&B that delivers the pleasantly unexpected. Perfectly located at King & Prideaux in the heart of Niagara on the Lake, Bernard Gray Hall is ten minutes on foot from all four of the Shaw Festival performance spaces. 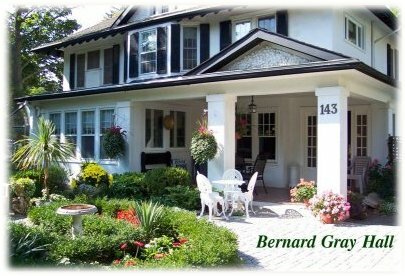 Bernard Gray Hall proprietors Gloria & Henry are attentive hosts, social animators, victualers of distinction, felix-philes of the premiere rank and holders of the key to their quaint community of Niagara on the Lake. They will discretely fulfill arcane requests but largely what is on offer is the comforts of home for those on the road. On Monday August 13th the power line failed for the Gerrard streetcar line eastbound. This video shows the arrival of some maintenance-of-way equipment, and their repair work. A hot summer rain in my garden. Minimalist exploration of mid-century urban architecture. My feet, walking down a stairwell. Companion piece "Hallway". 2nd logical iteration is women's high heels. Convo me if you want to collaborate. Minimalist exploration of mid-century urban architecture. My feet, walking in a hallway. Companion piece "Stairwell".